Lake Eucumbene has finally started to rise again with a near 1% increase on last week. Tantangara has lifted 4.7% in the past week, and reports to hand suggest the portal is roaring! Jindabyne is the highest it has been in five years and continues to rise. There will be some great fishing to come in coming weeks. Fishing in the local area has continued to be excellent for bait and troll. So get out your gear and come fishing up here! 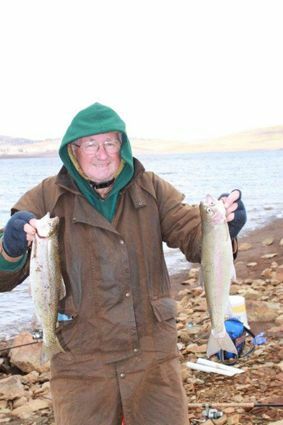 Lake Eucumbene:- Fly reports have improved with some nice rainbows about for those willing to search. There are also more and more browns getting back from spawning and searching the edges for food. So get out and have a go! Suggest wooly buggers, beadhead green fuzzy wuzzy's, tom jomes and midge pupa will all work depending on the conditions of the day. Best areas to try would be the Dam wall, Seven Gates, Collingwood and Coppermine bay. A boat would be an advantage at present. Lake Jindabyne:- Jindabyne reports have been ok for those who searched with wets on the weekend. Conditions for polaroiding were reasonable on the weekend but fish have been hard to find from most of the reports coming in. Try Hayshed, Sids, Waste point and Kalkite. Lake Tantangara :- Reports have been quiet though with the lake at 12% as of Monday, the fishing will be good if the lake continues to rise over the next few weeks. 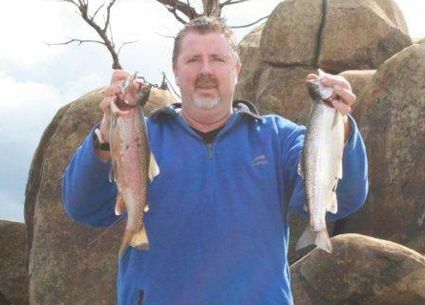 Eucumbene:- Eucumbene trolling reports have been very good with a few boats catching some nice fish. 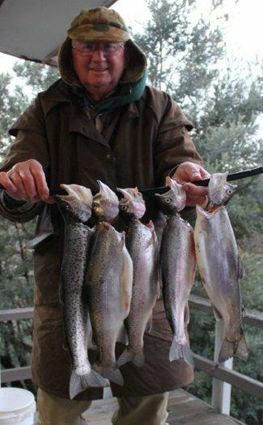 Overal the lake has been fishing very well on the troll with both flatline and leadcore producing fish. Best lures this week were Rebel's black crickhopper, tassie's and lofty's in orange and RMG scorpions in gold. Edge fishing has been good but deeper water and fishing lures deeper is the go if it is clear and bright. Collingwood and Cobrabald areas have been very good. 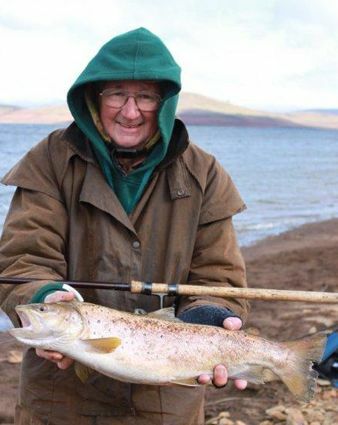 Jindabyne:- Deep trolling seems to be a little more productive in Jindabyne with the eastern shore producing some good browns. 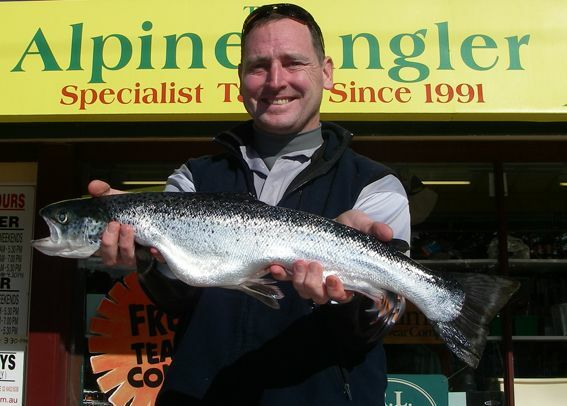 * Craig Owen had a troll in his Saratoga Kayak on the weekend and came up trumps with this great 62 cm Atlantic salmon. The fish took a green and gold viking minnow. Bait fishing has been excellent with some nice reports of rainbows being taken on powerbait and grubs. which was a bit thin due to spawning. *Johnny Scrubworm had a nice middle of the day session on Sunday at Buckenderra catching a very nice 1.3kg brown on a scrubworm. His fishing mate Trevor Heise caught a nice rainbow on Chunky Cheese gulp as well. Jindabyne reports were again quiet this week, though there have been a few browns cruising the edges at times. With the weed beds further out with the rising water casting a bait out further should increase your chances.